The eagle has officially landed in San Diego, in the form of nationally revered Del Frisco’s Double Eagle Steakhouse. 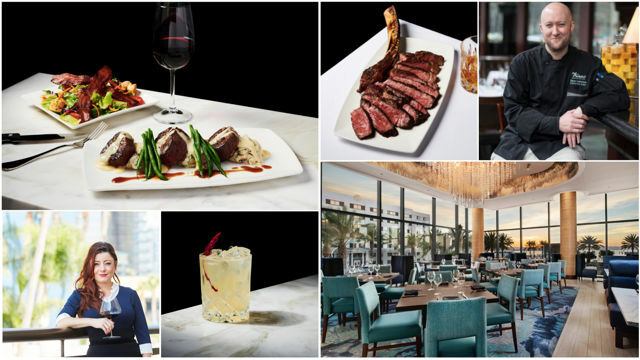 Having opened doors this past Saturday, November 3rd, the 16,655-square-foot, two-story, indoor-outdoor luxury steakhouse sits at the intersection of Broadway and Pacific Highway anchoring the new InterContinental San Diego. As a cornerstone of the BRIC mixed-use development, Del Frisco’s overlooks Lane Field, the waterfront park that was the original home of the Pacific Coast League Padres. To commemorate the first West Coast expansion of the brand, Del Frisco’s held a ceremonial first pitch with former Padres Hall of Fame pitcher Randy Jones and a red-carpet benefit for Padres Pedal the Cause (501c3), which raised nearly $10,000, prior to the public opening.